Dietrich, M., T. Kearney, E. C. J. Seamark and W. Markotter. 2018. 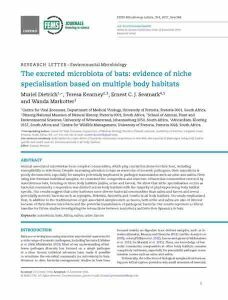 The excreted microbiota of bats: evidence of niche specialisation based on multiple body habitats. FEMS Microbiology Letters. 364: fnw284. doi: 10.1093/femsle/fnw284. Animal-associated microbiotas form complex communities, which play crucial functions for their host, including susceptibility to infections. Despite increasing attention to bats as reservoirs of zoonotic pathogens, their microbiota is poorly documented, especially for samples potentially implicated in pathogen transmission such as urine and saliva. Here, using low-biomass individual samples, we examined the composition and structure of bacterial communities excreted by insectivorous bats, focusing on three body habitats (saliva, urine and faeces). We show that niche specialisation occurs as bacterial community composition was distinct across body habitats with the majority of phylotypes being body habitat specific. Our results suggest that urine harbours more diverse bacterial communities than saliva and faeces and reveal potentially zoonotic bacteria such as Leptospira, Rickettsia, Bartonella and Coxiella in all body habitats. Our study emphasised that, in addition to the traditional use of gut-associated samples such as faeces, both urine and saliva are also of interest because of their diverse microbiota and the potential transmission of pathogenic bacteria. Our results represent a critical baseline for future studies investigating the interactions between microbiota and infection dynamics in bats.